Boria Majumdar is one of India’s famous sports writers and a authority on the subject. In this book, he brings about a fascinating exploration of cricket—packed with lively narratives and never-before-seen photographs. The hard cover edition is perhaps the most comprehensive and authoritative account of modern Indian cricket history. Eleven Gods and a Billion Indians takes you on a historical tour of India’s utmost popular sport—going from early tours in 1886 to the more modern IPL, offering a complete understanding of the evolution of the game both on and off the field. Containing material that has never-been in the public domain before, this book showcases in-depth research on cases like Monkeygate, the suspension of Lalit Modi, match-fixing scandals, and more controversies and incidents which have made Indian cricket to what it is. Intertwining together personal interviews, rare photographs, and letters, Eleven Gods and a Billion Indians asks some significant questions that need answering, among them: Has internal struggle and egoism impacted the on- field performance of the Indian cricket team? Did some icons fail the nation and the sport by trying to hide key facts during the spot-fixing inquiry? And does it matter to the ordinary fan who heads the BCCI if there is transparency and culpability in the system? 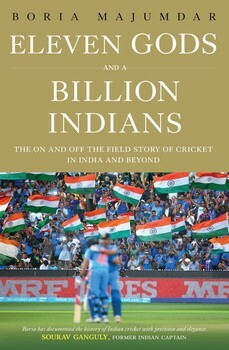 Recounting the past of cricket throughout colonial and post-independence Indian lifespan, Eleven Gods and a Billion Indians gives captivating insight into those who support, endorse, play, and watch the sport, as well as the entire country now considered the global hub of the world of cricket. I however found it hard to believe that the author chose to ignore the contribution of Subhash Chandra and Kapil Dev led ICL. It was Indian Cricket League which led to the creation of IPL and credit should have been due there. While the author has been generous enough to devote a chapter to Women cricket, more history would have been great. The book is about the Gods anyways so maybe the skip is okay.